Cedarwood has a dry woody aroma, slightly camphoraceous, smoky, balsamic, very subtle with a hint of spice. Cedar, also known as Cedrus, is a genus of coniferous trees in the plant family Pinaceae, native to the mountains of Himalaya and the Mediterranean region. 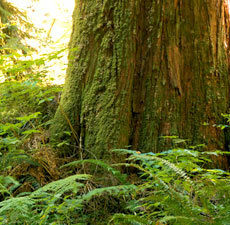 The oil obtained from cedarwood is one of the oldest ingredients used in perfumery. Cedarwood has a distinctive woody, spicy-resinous scent that has been used as a base note of many famous perfumes. Cedarwood is also one of the most commonly used perfume notes, mentioned at least once in the fragrant opus of every perfumer. Cedar Essential Oil has been used for muscular aches and pains, removing warts, rheumatism, skin afflictions, as well as cosmetics, perfumes, and scenting soaps. It is reputed to have antiseptic, anti-putrescent, anti-seborrhoeic, aphrodisiac, astringent, diuretic, expectorant, fungicidal, mucolytic, sedative (nervous), stimulant (circulatory) and tonic properties. The ancient Egyptians prized this oil, mostly for embalming purposes, but also for cosmetics and perfumery, and Solomon's Temple was built with Cedar Wood. Cedar chests have always been used to store woolen articles and protect them from the larvae of clothes moths. Today, numerous herbal and pet shampoos and natural insect repellents contain Cedarwood Oil as an active ingredient. Non-toxic, non-irritant and non sensitizing. Avoid during pregnancy.